I first met Andrea as a first-year university student. She had recently arrived in town to take up the post of Acting Head of Voice at The Melbourne Conservatorium for six months. My voice teacher Merlyn Quaife (now also a tremendous colleague, fellow Songmaker, and currently also my boss at Monash University) was on leave, so all of my lessons that semester were to be with Andrea. On her first day, my eighteen year-old self promptly marched into her office to say hello, set up a lesson time, and make some suggestions about a few things she might like to undertake while in the role. Her experience as a pianist, chamber musician and vocal coach was extensive and had encompassed the globe, and here was me - the young upstart! After that first encounter, it's a wonder she put up with me in those lessons at all. Since then (by some miracle), we've travelled all over the country together giving recitals and working on operas. In 2011 she founded Songmakers Australia, and I was stoked (if not a little surprised!) to be asked to join the ensemble as a core member. Some of my fondest memories include performances of the Schubert Schwanengesang in Canberra (something I shall return to blog about in the coming weeks), working on the The Rake's Progress together in Auckland, the first time we did our Piazzolla tango program at the Melbourne Recital Centre, a visit to Perth to observe rehearsals for the production of Elektra she was working on for the Perth International Arts Festival, our very first Sunday Live Broadcast on the ABC featuring Stephen Hough's Other Love Songs (actually the first time we were to collaborate with Andrew Goodwin, who would later become a core Songmaker), and countless road trips in my 1992 Ford Falcon (that Andrea christened "Berta" after the housekeeper in the Barber of Seville) to give concerts in the most beautiful Victorian towns. As you would expect, our relationship has evolved over the years. It took me a little while to move on from being her student to being her colleague. Rehearsals in the early days were coachings ("Make sure this phrase travels through to here; Be sure to breathe in the tempo you want; Follow the left hand here; Which vowel is that?") but since starting Songmakers, our work together has morphed to become an equal partnership. We come to rehearsals each having done our own preparation and research and with our own ideas, and the process is one of finding common ground. It is extremely rare that we will have a completely different view of a piece, but in those circumstances we try it both ways before finding a compromise. She sometimes still coaches me, and if there's something she hears in rehearsal that doesn't sound right, she will always ask before tweaking it. She has encouraged me in this career no end, and by all of these things I know she respects me as a singer, musician and artist. 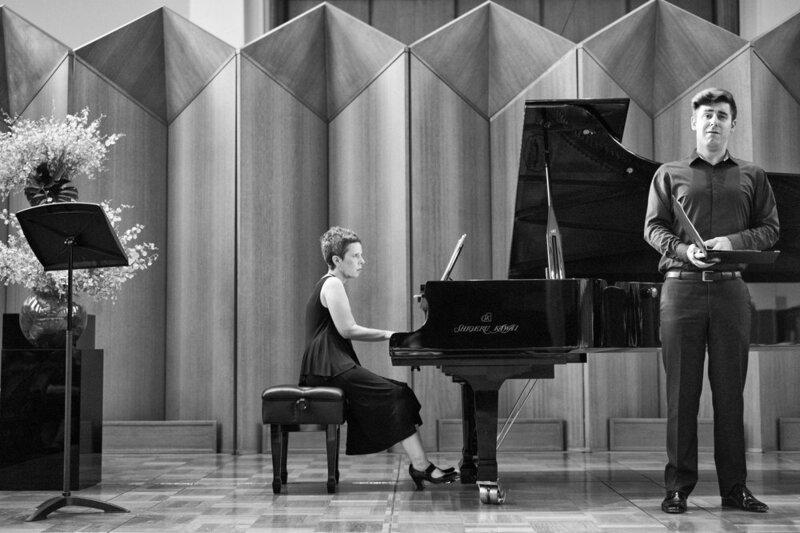 The nature of the Lieder partnership is a special one. 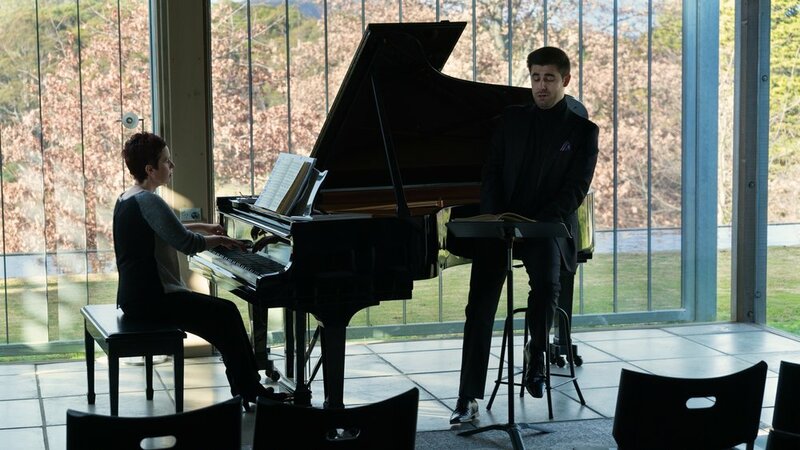 It is not a song recital without the singer, but the piano truly is of equal importance. The more time one spends in rehearsal with one's associate artist, the more closely one comes to understand their dispositions, musical priorities and quirks. Both parties bring their experiences and lay them at the service of the music. All of this takes time to develop, and is probably best done over several cups of tea! The best partnerships last a life time. Really, Andrea does so much more than just "accompany". We are such terrific friends. Our performances are a melding of minds and our rehearsals, a sparring of ideas. I am continually amazed by what she can do. Many of my colleagues know that I like to take risks, never completely changing what has been rehearsed, but I like to play with things on the spur of the moment. If I'm slightly late with a consonant for expressive effect, Andrea will be there. If the mood takes me and the rallentando becomes grander, she will follow. If she senses I'm struggling to make a phrase, she will forge on. If I get lost, she will catch me - and all while providing such incisive musical commentary on the words!